W7 Outlet & Boots September 2017 Haul – Small But Expensive! Over the weekend Boots were celebrating 20 years of their Advantage card with 20 points per £1 spent when you spent over £50, for those outside the UK that would mean that you would get £10 worth of points back when you spent £50. I also knew that I had a lot of other extra points vouchers which I could match up with my shopping and bag myself an extra good haul of points, and wanted to grab another perfume as my collection of ones I love is starting to dwindle significantly, which you will have known if you’ve seen my 2017 perfume collection. This was just featured in my empties and I said I was going to hold of repurchasing it until it was on offer, and it was on offer in store. The 80ml bottle had £10 off making it £65, which is still pricey, but I’m hoping the larger sized bottle will mean I can make this last until at least next summer. Whilst I am trying my best to use up a lot of perfumes I don’t love to declutter my collection, if you’re going somewhere nice sometimes you just need an old favourite on hand. This is now my third bottle of this and it’s one that’s probably going to be in my collection forever now as it was one of the two perfumes I wore layered on my wedding day. I’m going to keep this in my cupboard away from the daily ones I have on rotation in an attempt to stop myself using it so frequently as I can’t help myself when it’s out! Review of this has previously been posted here if interested. I saw the Maui line featured on Jodi’s blog a month or so ago and at the time I’d remembered seeing them appear in Boots for the first time. I was really curious because…. well look at that packaging, but had quite a few bottles of Aussie still lingering about. I know I’m on my last stocked up bottles of Shampoo and Conditioner currently in my shower so I thought it was time that I picked up some backups as there’s nothing worse than running out! This is a pretty pricey line I must say – these bottles were £8.99 each so I have high expectations of their performance. The small silver lining of the £8.99 each was that they were on 3 for 2 so I also picked up a hair mask as part of the offer. I toyed with getting the Shea Butter mask when I was browsing online the night before going to the store but when I got there it was out of stock and deciding between all the other Maui Moisture products, settled on the Agave mask with was for strength and anti-breakage, I’ll report back on all three of these as a trio in a few weeks! Again the night before I was trying to find a new pressed powder online and spotted this on the website, it had no reviews so must be a relatively recent release and my hometown boots is pretty small and only stocks about 5 brands so knew I’d only have a small selection to choose from. I decided not to read up on any reviews and buy this without any ideas of whether it would be good or not (they didn’t even have a tester in the store). This was pretty pricey for L’Oreal in my opinion, £12.99 for a loose powder is definitely mid range territory. I was tempted by a 3 for 2 offer to try the True Match foundation, however the small stand didn’t have the right colour and I suspected I was between 2N and 4N – and there was no 3N available. Overall this all came to £99 with a couple of vouchers, I also had a 500 points (worth £5) when you spend over £50 and another double points voucher (which sadly didn’t double the 20 points, it just doubled it as a normal £99 spend), 100 extra points (worth £1) and all together I added £33 worth of points to my advantage card, which makes me feel slightly better about spending £99! I normally save my points up until after Christmas and spend my points when all the gift sets go into the sale, which is when I normally stock up on perfume for the year. It’s rare I actually spend money on a perfume, I normally get it as a gift or with points. I mentioned in my hair empties I needed to go stock up on pink hair dye, I picked up 2 of my favourites Rose Red and one Apricot shade. 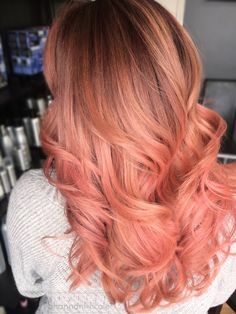 I’m actually hoping to make my hair a peachier/rose gold shade rather than brighter, I just think it’s a bit too much now going into autumn and I’m going to attempt mixing the Apricot shade over the pink, but need one side of my hair to fade a little more before I attempt this! I’m hoping this will happen over the next wash or two, however I have a family wedding party next week and I’m hoping that I won’t have to redye it bright because it looks rubbish before then and it’s faded evenly enough in the meantime to do so. I saw this and decided to try it out as it was similar to the L’Oreal one in terms of it’s claims but a hell of a lot cheaper at £2.99. I’ve decided to do a post of the high end (Make Up For Ever Ultra HD), vs the Mid (L’Oreal) and this as the low end to see where the difference in loose powder performance lies. That was it, a rather expensive hour’s shopping trip on Saturday! Let me know in the comments if you’ve tried any of these items in the past! Can’t wait to see our review on that shampoo and conditioner, they look really interesting! I’ve done peach before with those two exact directions shades, I’d recommend mixing just a tiny bit of the rose red into the apricot as it’s so dark it tends to overpower the orange tones completely! I still need to try the hair masks! Hopefully they will have them in stock when I go! The Paco Rabanne Olympea perfume must be amazing for you to pick up another bottle so quickly. I received one of the Maui Moisture Hair Masks from a blogger event – have yet to try it though, I’ve heard good things. Peachier / rose gold hair would be interesting – I can’t picture it in my head though! Will have to see how it turns out on you! Had it not have been on offer I might have chosen something else, I was actually planning on doing so but my local boots is so small their selection wasn’t amazing and it was so busy in there due to the points event/all the perfumes samples were locked away I just picked what I knew rather than bugging the staff assistant! Nice drugstore haul! I recently picked up some of the Maui stuff, too. Not loving the conditioner 100% but I have the shampoo to try (I know, I’m weird, I rarely use the matching ones together). Love that the shampoo is SLS-free. I’m really excited to see what you think about the Maui products, as this alone has given me such an urge to splash out on some! They do look lovely though. Also slightly unrelated but your photos are beautiful! I have a review of the Maui Products going up next week! The packaging is a terrible encouragement!